Sometime in the mid-1940s the American Sabbath Tract Society decided to publish "a collection of Seventh Day Baptist hymns and songs." The Tract Society was the predecessor of the current Tract and Communication Council of the Seventh Day Baptist denomination. It was the then publisher of the Sabbath Recorder, as well as denominational tracts, pamphlets and books. My uncle, Rev. Victor W. Skaggs, then the Secretary of the Tract Society, along with Rev Lester G. Osborn and Howard Savage, the organist for the Plainfield, New Jersey, Seventh Day Baptist Church, comprised the committee responsible for producing the collection. .... 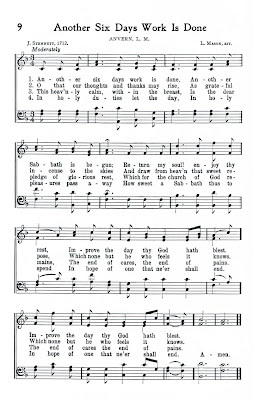 Seventh Day Baptists have shown their interest in worshipful song in their compilations of others' songs and in the composition not only of hymns and songs related to the Sabbath, but also of hymns and songs of Christian faith and life. This present collection does not purport to be exhaustive or complete. It is a selection from the available works of Seventh Day Baptists of the past and of modern times. We present it to you with the hope and the prayer that it may inspire us all with the message of our faith—Christ and His Holy Sabbath Day. For many years there has been no explicitly denominational hymnbook. Each church chooses whatever they believe will enhance their own worship style. So far as I know, there has been no new collection of distinctively Seventh Day Baptist worship music. We Glorify Thy Name remains one of the best collections of songs and hymns by Seventh Day Baptists. It is probably time for another committee to prepare another collection, but until that happens I thought it might be a service to make this one available. 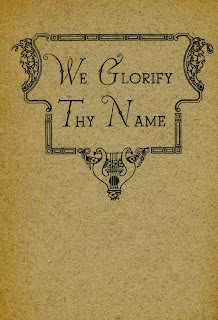 We Glorify Thy Name can be downloaded as a pdf here or through the cover image above. There are three Stennett hymns, including "Another Six Days Work is Done" by Joseph Stennett [on the left - click on it for a larger image], and Samuel Stennett's two most famous hymns, which can be found in many hymnbooks. Others include some still well-known to Seventh Day Baptists, for example "God of the Sabbath" and the "Young People's Rally Song" [with its original wording], as well as some that probably should be. The music for several was composed by J.M. Stillman, a long time music instructor at Milton College who achieved some prominence in his time. There are a few choruses, including "To Know Him!" which some older Seventh Day Baptists will remember from campfires. Others may deserve to rest in obscurity. In any event, here is We Glorify Thy Name. "If God is dead, so is reason." In terror or in peace? "'Till death do us part"?